In Switzerland, hydrological knowledge resulted from extensive observation, analysis and research in the course of years and decades – knowledge to be opened to a larger public by means of maps, given a coherent shape by the «Hydrological Atlas of Switzerland». This work is to approach all those who are concerned with the water, who take an interest in it – be it hydrologists in research and practice, experts in the field of hydraulic engineering and water management, be it politicians, authorities of whatever level, teachers or scholars . Not the single catchment as the classical sphere of activity in hydrology, but Switzerland on the whole is focused on by this Atlas. This very challenge has to be met, all the more as practice-related insights allowing the conversion of hydrological knowledge gained selectively or on local or regional scale into extensive practical and instructive Swiss overviews were more or less ignored up to now. In an alpine country of complex topography rather bold a plan, since the selected main scale 1:500000 requires spatially detailed statements. The editing of maps at the main scale, however, is not always feasible or sensible - smaller scales are preferred here and then. Exceptionally, the depiction of typical hydrological characteristics by means of profiles was favoured. The «Hydrological Atlas of Switzerland» comprises a systematic sequence of plates split up into eight chapters following a classification of hydrology according to the system elements: precipitation, snow and glaciers, evaporation, rivers and lakes, water balance, soil- and groundwater. The chapter «material balances» considers physical and chemical aspects of the system elements whereas the «fundamental maps» cover introductory topics or different system elements. The thematic classification into a total of eight chapters is emphasised by the coloured lay-out of the maps and their decimal labelling. Each chapter is assigned to one colour and numeral. The map representing the crucial part in any case, it embraces several elements at the same time. Explanatory comments on the significance and use of the depicted topic are included in the text page. Limited space given, the authors had to confine themselves to the essential. Diagrams and tables arranged on the reverse of the map help broaden its thematic content. Exceptionally, an additional table page is added, particularly with maps depicting hydrological networks. For the structural concept, the maps, charts and tables are bilingually composed, explanatory texts show quadrilingual wording. Every single map is manifold, focusing on ease of application by merging into one unit any essential sources for daily use in science and practice. Some maps will therefore allow individual calculation by means of the charts and formulas. In agreement with the project lead and the scientific committee, the authors drew up both map and explanatory text. The ultimate production such as the map making, the scientific and cartographic processing and editing was carried out in the Geographical Institute of Berne University. 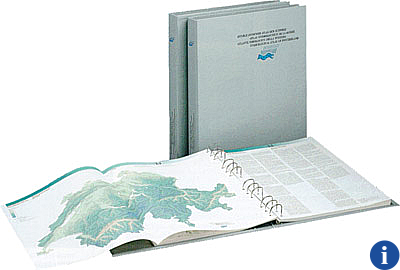 The «Hydrological Atlas of Switzerland» having emerged from a team-effort by the Swiss hydrologists, many others contributed to its realisation: graphic designers, translators, printers, cooperators within the project lead and various federal offices, as well as others. Particularly recognised be the cartographers, with Andreas Brodbeck in charge of the lead, for their valuable help in forming the Atlas. The «Hydrological Atlas», due to reach completion over several phases, has been compiled as follows: In 1992 the first set of 17 plates called the attention of scientists and experts, and of a wider public. Followed by a second, third, fourth, fifth, sixth, seventh and eighth instalment in 1995, 1997, 1999, 2001, 2002, 2004, 2007 and 2010, the work currently contains 63 plates and 2 transparent sheets. Total cost at present: CHF 620.–. There is no sale of single plates.